Do you want worry free moving with a local Utah Moving Services company with a proven track record? Think Moving Connections. Would you like to use a professional moving service that has its roots in Utah? Once again, that’s Moving Connections. Would you prefer to use a professional Utah Moving Services company that is federally licensed, bonded, and insured? Moving Connections is federally licensed, bonded, and insured for your security. If you would like to hire a company that has all of the above qualities and still has affordable, up front rates and responsive service, then Moving Connections is your local moving company. Moving Connections is in the business of moving families and individuals. That’s why we work closely with you to coordinate a seamless transition to your new home. Of course, we also move businesses, whether it be just a small office move or a large corporate relocation. If Moving Connections is moving you to South Jordan it's a perfect time to begin to utilize the many resources and bounties of South Jordan. For example click on the picture to the left to go the Moving Connections 'Support - Advice - Assistance' page and discover South Jordan for the first time. Once you are on the 'Support - Advice - Assistance' page go ahead and open the .pdf link found there and tape the list of emergency and useful phone numbers on your refrigerator. 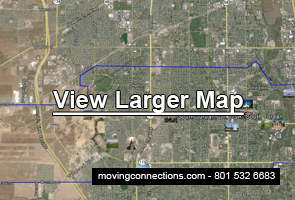 Moving Connections has gone to great pains to find those links and connections to integrate you quickly into South Jordan life.